James Patterson raises the stakes to their highest level, ever-when Alex Cross becomes the obsession of a genius of menace set on proving that he is the greatest mind in the history of crime. Detective Alex Cross is a family man at heart--nothing matters more to him than his children, his grandmother, and his wife Bree. His love of his family is his anchor, and gives him the strength to confront evil in his work. One man knows this deeply, and uses Alex's strength as a weapon against him in the most unsettling and unexpected novel of James Patterson's career. When the ones Cross loves are in danger, he will do anything to protect them. If he does anything to protect them, they will die. 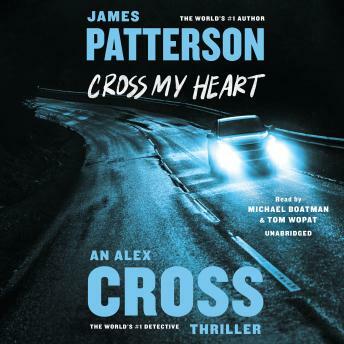 CROSS MY HEART is the most powerful Alex Cross novel ever, propelled by the ever-ingenious mind of James Patterson, the world's #1 bestselling writer. Great story!!!! Loved it. Alex Cross never fails. The narrator read too fast, and it was weird when he tried to do other voices . But I still enjoyed the book. Thanks! Loved the book and loved the narration. I have an almost two hour commute to work and I found myself getting excited for the drive to hear what was going to happen next.